I was working long on JDeveloper 11g extension for ADF 11g code quality checks. Finally it is available for public use - first release. 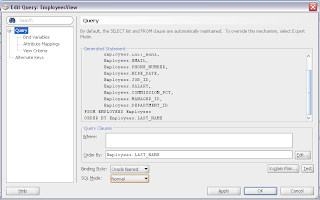 This release is based on my Oracle Forms to Oracle Fusion 11g migration experience. 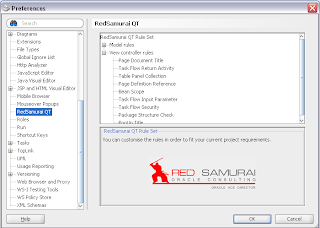 You can download extension - redsamuraiqt_1_0.zip and install it through JDeveloper Update wizard. 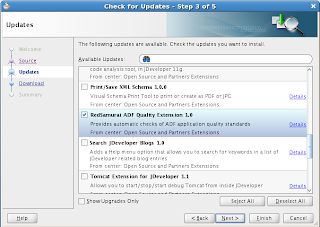 It is available directly from Oracle JDeveloper Open Source and Partners Extension update center as well. Additionally, you can download sample project I'm using for this post - RedSamuraiToolTestSample.zip. Check for my next blog posts on the same topic - I will post updates and extension improvements. Very impressive and a really good idea. Will evaluate it soon. Thanks Aino, in my next posts I will describe more how to use the rest of the rules. I haven't been able to play around enough yet to validate how effective it is, but this is just very neat. Great idea. 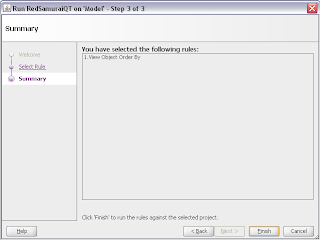 whether customers can add his/her own rules in a simple way. or we can only request you to satisfy new requests. Technically, we designed it in a such way, that it will allow customers to plug their own rules. 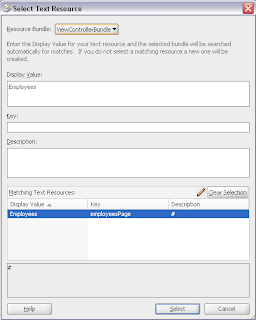 However, in first release this functionality is disabled. Good stuff. Don't let Oracle to steal your idea & asset. Thanks. Thanks, if there will be something similar from Oracle, I will be only happy - it will make ADF popular even more. From our side, we will continue to do updates for this extension, based on most common problems we encounter in ADF projects. Hi, I use jdev 11g latest. Where should I look for JDeveloper Update wizard? Can you help me to install? Thanks. You can open this wizard through Help -> Check For Updates. Thanks. I have installed it using wizard through Help -> Check For Updates. I have opened your test jws using jdev 11g. Now, how do I open the testing tool? 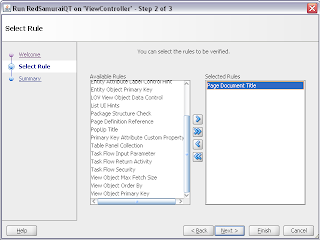 Please read this blog post - I describe "In order to invoke Red Samurai tool, right click on Model or ViewController project and select RedSamurai QT option"
'Entity Attribute Label Control Hint' i got al lot of violations with"Label not found on attribute 'XYZ'". All EO was created with 'Business Components Wizard from Tables' and i cannot find the right place where i can set a label for a EO attibut. Please, could you give some suggestions for using this rule? You can double click on attribute name in Entity and go to Control Hints section. There you will find Label property. Out of curiosity, is this leveraging JDeveloper's Audit framework? If not, what did you need to do in your extension that the Audit system couldn't provide? 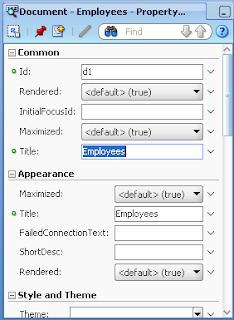 JDeveloper's Audit provides standard ADF validation. 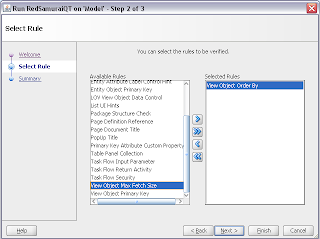 We are implementing logical validation, based on different rules, for example - check if table component is inside panel collection. I would like to find every table that has the contentDelivery attribute either missing or set to the default of "whenAvailable" How would I do that? We need to change those to be either lazy or immediate so that our performance testing tool sees the same number of http requests on the playback as it saw on the recording. Its not supported in current version, but we could add this feature on customer request. When will your extension be available for 11.1.2? I tried installing it and it didn't throw an error, but it also didn't show up under the "Project Properties"
Thanks for your interest. 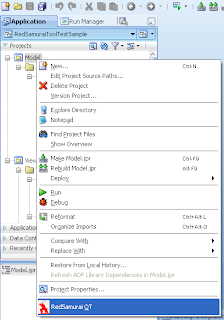 We are planning to add support for JDev 11 R2, from next patch set of JDeveloper. I am a member of a project which is developed as a Oracle ADF Fusion Middleware Webapp. We use JDeveloper 11.1.2.0.0. As you say in this post it does not support JDeveloper R2. Now does it? No it doesnt support R2. Unless some customer will ask us to migrate to R2. Could you please point me to source code for this tool... thanks. You can change package naming config in the settings. We are working now on the next version, improved and easier - we will announce it later in the year, close to UKOUG. 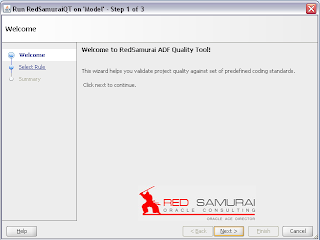 Hi Andrejus, is there any way to run Red Samurai Tool in command line in order to embed the tool in a Hudson job (while building the application or a job that only validates the code quality)? Possible, but not in the public version. Hi Andrejus,is this tool compatible with Jdeveloper Studio Edition Version 12.1.3.0.0...? if possible please provide the download link. For ADF 12c, you should use ADF EMG Rules. The tools is not available for download for ADF 11g currently, the link seems to be broken. Please can you help and/or fix the link so that we can download the tool. This is administered by Oracle.